It is quite ironic that we take out insurance in Spain for all sorts of possibilities that may never happen. We take out car insurance in case we have a car accident and we take out home insurance in case our home is destroyed in a fire or flood but the one certainty which is death, we don’t insure for! Of course none of this really want to face the reality that we are going to die but this is a little unfair on your dependents who will have to pick up the pieces at the most awkward and difficult time when you pass away. Not just emotionally and financially. Can they even afford to pay for your funeral? When you look at the subject of funeral insurance you will also commonly see the term funeral plans (or funeral cover) and in this article we explain these definitions. When someone dies in Spain all arrangements will have to be made within forty eight hours of the death as it is Spanish law that all funerals are held within this period, mainly because of the extreme heat of the Spanish climate. This puts an immediate time pressure on your family and relatives to very quickly deal with the arrangements for your funeral or cremation. Given the fact that you are an expat in Spain it is even more difficult because all of a sudden many relatives from all over the world, but in particular the UK, must suddenly fly in at short notice. If however in advance, you have taken out a funeral plan or funeral insurance, then at least some of the stress can be avoided. Responsible people will have sorted out this aspect of their lives long before it becomes a necessity, as with the language barrier and other paperwork required in Spain, this all takes time and can prove to be quite a challenge. The other positive in addressing the issue of funeral plans and insurance now is that you will also consider taking out a will in Spain which will again sort out a lot of difficult administration in the event of your death. 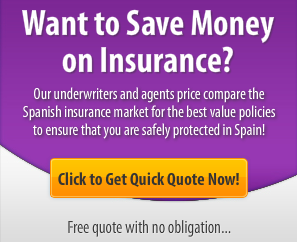 Where Can I Get Spanish Funeral Insurance? If you are looking to take out funeral insurance or a funeral plan in Spain you will be wondering where to go, what to do and how to get the cheapest price. Getting the lowest quotes is no different to the methods you would take if you were insuring your car. Currently there are no price comparison websites to help you take out funeral insurance so you will need to do a little bit of work yourself in price comparing between different insurance companies such as Mapfre and by using insurance brokers in Spain to do some legwork for you. Below we will give you all the different options. Insurance brokers are probably the easiest option for you if you are an English speaking expat in Spain as you can go to brokers such as Jennifer Cunningham, Knight Insurance and Abbeygate who provide English funeral plans in Spain. In this way they get you the best possible price by comparing the different insurance companies, you get your policy in English and you can ask questions if there is anything you are unclear about. Alternatively you can go direct to some of the major companies we list below who provide funeral insurance and funeral plans. The top funeral cover providers in Spain are Golden Leaves and Avalon. The legal/privacy bit we have to put in – Note that you are using this form to submit your details to us so we can then compare the market and give you options for a funeral plan. Our privacy notice at the footer of our website lets you know how we use your data and how to request removal. You don’t need to do anything other than fill in your details and let our brokers do the rest. The financial costs of a funeral or cremation in Spain have rapidly increased over the last few years. Often the cost of a funeral in Spain can be €4,000 when expenses such as a minister, paperwork, coffin, casket, car and service costs are added up. Clearly these costs will only rise in future. Spanish law states that human remains must either be preserved or embalmed by an undertaker within 48 hours of the death. Spanish undertakers will normally embalm expats because in many cases there is a desire to repatriate the body to the home country such as the United Kingdom. This is yet another question that many expats in Spain have not considered – when you die do you want to be buried or cremated in Spain or do you wish to be buried or cremated back in the United Kingdom? Flying a body back to the United Kingdom is of course very expensive and costly and this is exactly why you should make payments into a funeral plan now. Spanish undertakers will be able to help you with details such as the coffin required or casket and the paperwork involved in dealing with the local civil registry death certificate, a certificate of embalming and the certificate giving permission to transfer the body back to the UK. As an alternative you may wish to be buried or cremated in Spain and certainly this would be much cheaper. Many burials in Spain often involve a crypt which is above the ground not underneath it. Cremation in Spain is an alternative which is simpler because there is less paperwork and cost should you wish your ashes to be repatriated back to the United Kingdom or elsewhere. Your ashes can be flown on a regular scheduled airline as long as they are placed in the hold or flown as cargo, they cannot be transported by hand luggage. Taking out a funeral plan now provides a fixed price for the cost of your funeral or cremation. You then make regular payments towards this cost in the knowledge that your funeral expenses will be covered upon your death. Or if you prefer, you can make a one-off payment instead of instalments. Below we have some frequently asked questions about Spanish funeral plans. Many people ask why they should start to take out a plan now? The obvious answer is that you just don’t know what is going to happen and when you may become deceased. By taking out a funeral plan now, you will be fixing the cost of funeral or cremation, whichever you choose. Your funeral plan covers all of the costs of the funeral services as specified and outlined in your individual plan. However in some cases your estate or executors may be asked for an additional contribution towards costs if prices of things such as crematorium fees or burial costs have risen beyond the increase in the Retail Price Index (in other words the inflation rate). You can also plan out the details of your service such as what hymns you wish to be played and what you wish to happen. If you die before you have made sufficient payments then your relatives and family or the executors of your will or estate, will have to make up the difference but at least you will have relieved much of the financial burden. Golden Leaves are definitely the market leader when it comes to funeral insurance and funeral plans in Spain. In fact most insurance brokers that you would approach will be directing you towards taking out a plan with them. “Golden Leaves Limited has been at the forefront of pre-paid funeral plans for over 25 years. Since 1984, tens of thousands of people throughout the UK and overseas have chosen to plan ahead and purchase a funeral plan with Golden Leaves. Purchase a pre paid funeral plan right now and you pay today’s prices and your money is invested in a secure independent trust for both its protection and to ensure future growth. “Many expatriates living in Europe have experienced problems incurred by a death overseas. A lack of communication and understanding of funerals can leave people of all financial standing bemused and bewildered at a time of great distress, especially if families are thousands of miles away. Costs: Funeral costs can be in excess of 4,000€ and they are rising at around 10% a year. Distress: Funerals can be completed within 24 hours, a very big change from your home country. Payment: The funeral bill is often paid in advance or on the same day as the funeral. I have heard that bank accounts are frozen at this time and that I have no control over the individual funeral director selected and his demand for immediate payment, as is the custom, upon my death. Language Difficulties: If you can’t speak the language you are potentially vulnerable. Will I get the service that I want and at the right price? Balmoral: A basic cremation funeral covering the essential items pertaining to the removal and disposal of the member, suitable for single people with no family. This funeral could be completed in 24 hours. Britannia: A repatriation service covering many legal formalities, preparation in the country of death and the burial/cremation in a chosen second country. At Avalon we advise people about the complex, quick and expensive funeral system in Spain. Are you aware of the Spanish funeral system? How complicated, quick and expensive it can be? Death is a subject none of us want to talk about but if you live in Spain it’s something you must think about. EJQ SERVICES has been going for a number of years in affiliation with Golden Leaves Funeral Plans with 25 years in the industry and is a leading provider in Europe , Santa Lucia Insurance have 95 years in the industry and is one of the leading provider in spain and DeVere Spain with Wealth Management/ Financial Services Spanning World Wide. EJQ SERVICE specialise and pride ourselves offering this range of products with our personal touch customer service and aftercare for each of our clients.